Gimlet Media produces hit podcasts like Reply All, Homecoming, and Science Vs. It has a new 28,000 square foot production facility based in downtown Brooklyn which opened on August 13, 2018. 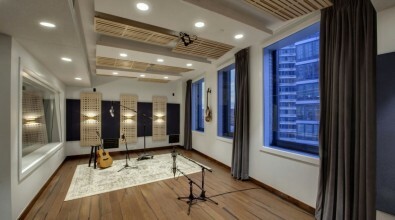 Designed in tandem with the acoustic architectural firm WSDG (Walters-Storyk Design Group) — known for its acoustic work on recording studios and performances spaces worldwide — the new facility catapults Gimlet’s podcasting operations from a modest studio operation to a commercial-grade, custom-built space. The design comes as podcasts gain in popularity, especially among younger demographics. 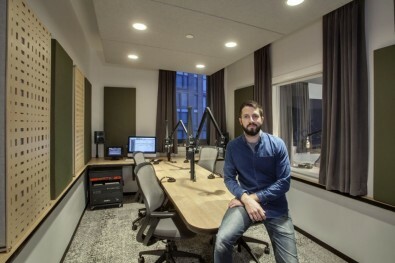 The new Brooklyn facility features 12 podcast studios, custom designed for different production needs, with each aligning to a consistent sonic signature. The studios fit together in a honeycomb fashion, maximizing the use of the available space while providing comfort and an abundance of natural light. Each studio is outfitted with top of the line microphones and recording equipment, and all of the sound is routed digitally through a customized Q-SYS Platform, designed specifically for Gimlet’s unique needs by Thompson and Matt Gajowniczek of Chicago-based integrator SPL. This provides podcast producers with the ability to work in rooms specifically designed for their needs, taking advantage of state-of-the-art technological advances in soundproofing, digital recording, mixing and monitoring. In addition to the podcast spaces, the production facility also boasts a traditional recording studio with additional soundproofing and a 375 square foot live room. 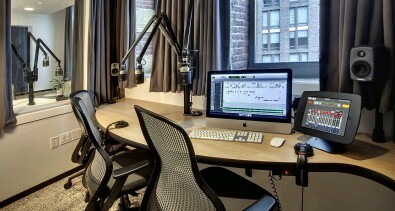 The abundance of space allows ample room for unique needs – like Gimlet’s scripted fiction shows, while enabling in-house recording of music for their various podcasts. Aside from efficiency and the embrace of a “self-op” approach to studio workflow, Thompson noted that the new technology allows producers to focus on telling great stories, while audio engineers focus on the creative sound design, mixing and composition that takes the medium to the next level. Gimlet’s new facility is an example of how podcasting has emerged into a mainstream media channel over the last two decades — a vast departure from its humble beginnings in the basements and garages. IP - A Golden Opportunity ?